The concepts of constitution and constitutionalism refer to the legal framework of a country. While constitution is often defined as the “supreme law of a country,” constitutionalism is a system of governance under which the power of the government is limited by the rule of law. Constitutionalism recognizes the need of limiting concentration of power in order to protect the rights of groups and individuals. In such system, the power of the government can be limited by the constitution – and by the provisions and regulations contained in it – but also by other measures and norms. In order to understand the two concepts – as well as their similarities and differences – it is important to understand their history and evolution. The idea of constitution has changed significantly compared to the first examples seen in ancient Greece, while the concept of constitutionalism has grown around the principle that the authority of the government is derived from and limited by a set of rules and laws. The constitution provides the foundation of the government, structuring the political organization and guaranteeing individual and collective rights and freedoms. Constitutionalism is a system of governance in which the power of the government is limited by laws, checks and balances, in order to reconcile authority with individual and collective freedoms. The principle of constitutionalism must be understood in opposition to nonconstitutionalism – a system in which the government uses its powers in an arbitrary fashion, without respecting the citizens’ rights. The idea of constitutionalism (and of constitution) is strictly linked with the progress and spread of democracies. In monarchic, totalitarian and dictatorial systems there is generally no constitution or, if it exists it is not respected. Individual and collective rights are often disregarded in dictatorial regimes, and the government cannot be held accountable as there is no legal document that defines its limits. The concept of constitutionalism has evolved during the last few centuries thanks to political changes and progress of democratic ideals. Both have evolved and significantly changed during the last few centuries, benefiting from the spread of democratic ideals and becoming key features of the majority of Western countries. 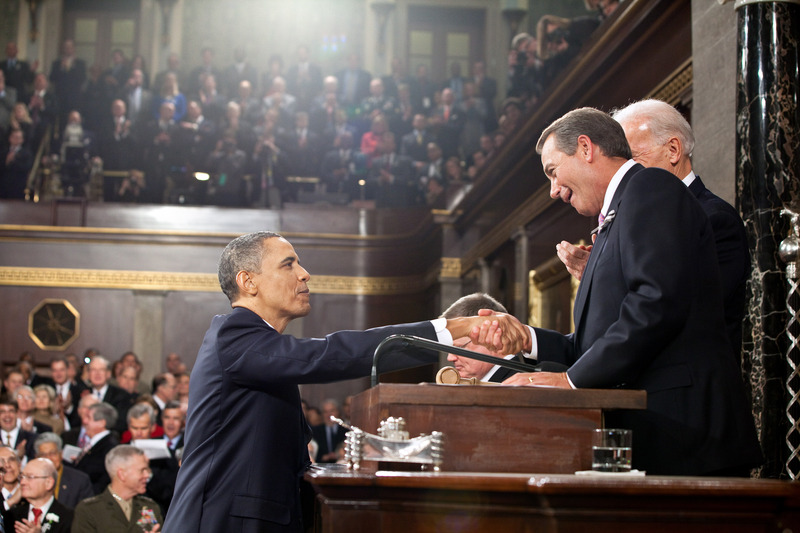 The constitution is often a written document, while the principles of constitutionalism are generally unwritten. Both constitution and constitutionalism evolve with the promulgation of democratic ideals – although they do not always proceed at the same speed. There can be a constitutional form of governance – that respects the rights of the citizens and promotes democratic values – even though the national constitution is outdated. At the same time, an inefficient democratic government may not be able to rule in a constitutional way, despite the existence of a constitution. The concepts of constitution and constitutionalism are strictly linked, but the second is much more than just the respect and enforcement of the national constitution (as the term might suggest). The creation of a constitution is the result of years of progress and evolution, but, in some cases – like in Japan – the constitution can be imposed by invading or opposing forces, and may not embody the key values and principles that characterize a society. Building on the differences outlined in the previous section, we can identify few other aspects that differentiate constitution and constitutionalism. 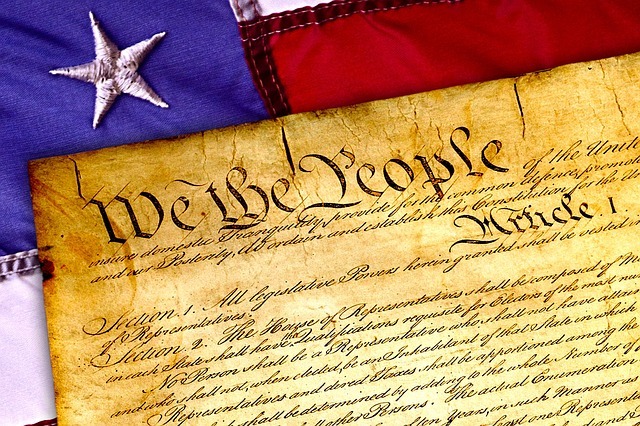 A constitution is an official document that contains provisions that determine the structure of the government and of the country’s political institutions, and that sets out regulations and limits for government and citizens. Conversely, constitutionalism is a system of governance defined in opposition to unconstitutionalism and authoritarianism. Constitutionalism is a principle that recognizes the need to limit the power of the central government, in order to protect basic right and freedoms of the population. Therefore, both concepts are linked to the idea of limiting the power of the government – and somehow creating boundaries for the acts of the citizens as well – but they are very different in nature. 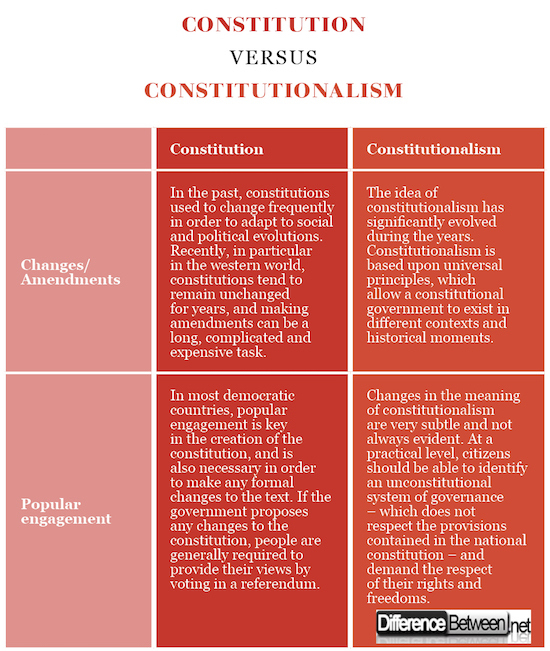 Constitutions, which are a key feature of today’s western societies, have evolved during centuries and continue (or should continue) to adapt to the changing nature of societies and political systems. Both constitution and constitutionalism are tied to the idea of democracy and provide the legal framework for citizens to enjoy individual and collective rights. The constitution is the basic law and backbone of a country, while constitutionalism is the system of governance based on the constitution – or on other core documents – and constitutional principles. In a constitutional system, the authority of the government depends on its compliance with the limitations under the law, which are often contained in the national constitution. Giulia Squadrin. "Difference Between Constitution and Constitutionalism." DifferenceBetween.net. April 2, 2018 < http://www.differencebetween.net/miscellaneous/politics/difference-between-constitution-and-constitutionalism/ >. Cata Backer, Larry. "From constitution to constitutionalism: a global framework for legitimate public power systems." Penn St. L. Rev. 113 (2008): 671. Macedo, Stephen. "Liberal virtues: Citizenship, virtue, and community in liberal constitutionalism." (1991). Moten, Abdul Rashid. Constitution and constitutionalism. Cengage Learning Asia Pte Ltd., 2008.